Lake Mabel (Port Everglades) taken in 1925 before the incorporation of the port with the Atlantic Ocean in the foreground. Courtesy, Broward County, Fla. In his 1870 Government Map of this section, Surveyor General Marcellus Williams named this feature Lake Mabel after Mabel, fiancee’ of James White. White and Mabel accompanied the surveying party along with Williams’s son, Arthur T. Williams. The Intracoastal Waterway runs through the middle of the Lake, paralleling the east coast of Florida from what had been named the New River Sound on both sides of the inlet. Arthur T. Williams became quite famous throughout the State, accumulating large parcels of land with and without his partner, James A. Harris. The name Lake Mabel is confirmed in the register of the Board of U.S. Geographic Names. 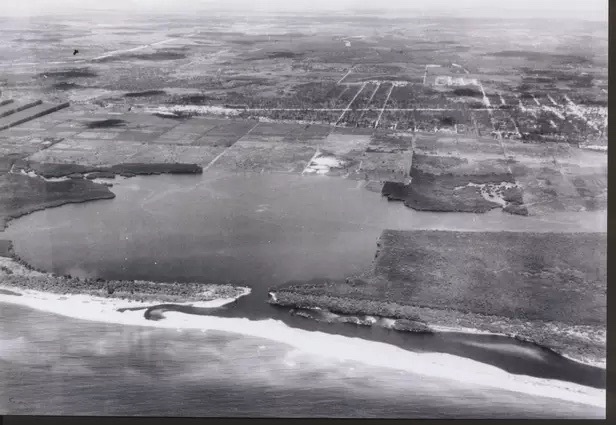 In the background, one can see the outlines of the making of the City of Fort Lauderdale’s new municipal airport, which was later named the Merle Fogg Airport, after a young aviator (Fogg) crashed and died west of West Palm Beach with his student at the controls. After World War II transformed Fogg Field into Naval Air Station (Fort Lauderdale), a large training base for Navy aviators, the Navy turned over the Airport to Broward County. The airport is now the Fort Lauderdale-Hollywood International Airport. This entry was posted in Uncategorized and tagged Arthur T. Williams, James White, Lake Mabel, Marcellus Williams, Port Everglades on January 23, 2015 by Florida's Big Dig.